Most investors in the domain name industry would be nervous to invest $185,000 in a single premium domain name. But on today’s show we interview a 27-year-old entrepreneur who invested $185,000 not once, but three times this year, spending a total of over half a million dollars in application fees alone to register new top level domains. This is the story of how a domain name investor built a registrar and is launching at least two (possibly three) registries. 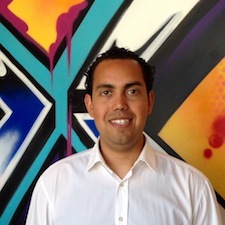 Daniel Negari is the founder of XYZ.com, a new top level domain slated to go live in early 2014. Negari is also the CEO of Cyber2Media, Inc., a company that acquires and develops premium domain names. Assets include Driving.com, BestHotels.com, Degree.com, CommunityCollege.com and PhD.com. Negari has been approved for two new top level domains .xyz and .college, and has also applied for .now (still in contention at the time of this interview). Most investors in the domain name industry would be scared to invest 185 thousand dollars in a single premium domain name, but on today’s show we are interviewing a 27-year-old who has invested 185 thousand dollars three times this year not in domain names, but in new top-level domain applications worth 555 thousand dollars. This is a story of how that happened. Stay tuned. Today’s guest is one of the youngest and most successful domain name investors in the industry. Many people have not heard of him. He has been below the radar, but he is receiving a ton of attention lately as a result of his new top-level domain applications for .XYZ, .COLLEGE, and .NOW. We are going to find out how he has been able to build such a successful career in less than a decade. Joining us on today’s show is Daniel Negari, Founder of XYZ.com. Daniel, welcome to the show. Daniel Negari: Hey, thanks for having me, Mike. Michael: I mentioned, in the intro, that you have only been in the domain name industry for about ten years. Is that correct? Daniel: Absolutely. I feel like I have been in the domain name industry all my life because, from a very young age, I have always been very interested in domain names, and Internet real estate is what I like to call it. Michael: Do you remember the first domain name that you ever registered and what year approximately that was? Daniel: Yeah, it was about 1998 or so. I remember being in seventh grade, in middle school, and I went to the computer lab and a friend of mine had mentioned to me that every three-letter .COM was taken and pretty much ever generic .COM was taken. So, I just sat in the computer lab for days, just trying to register domains, and I had realized that pretty much everything was taken. And at the time, I decided to start my first entrepreneurial real venture, which was a custom computer-making business. And I started this with a friend and we decided to register the domain name GetAPCNow.com. Daniel: And that was the best thing I could find. Michael: Yeah, today we can look back and laugh at that. I am like: “Well, that is kind of difficult.” It is like four words essentially. And so, what happened to that business that you started when you were still in middle school, or was that high school at that time? Daniel: No, that was middle school. I was about twelve years old, and I did really well. It was a business that I had a friend who knew how to put together computers and I had secured up my first credit card at the time, so I was able to go online and buy computer parts for inexpensive prices and put together custom made computers for friends and family. I had a pager at the time. I converted my personal pager to a business pager. I printed up flyers. I built a website on a GetAPCNow.com. I advertised my service. It was a lot of fun. Daniel: Years later, I let the domain expire and I did not even think about it. Somebody else picked it up and built a business on it. I do not know the details of the business, but years later I actually followed the domain name and waited for it to expire again, and then subsequently reacquired it. Michael: So, now you are the registrant again of GetAPCNow.com. Michael: And is that going to redirect eventually to XYZ.com? Daniel: Well, it will probably redirect to a .XYZ, as I make the transition to fully promote my newest domain extension – .XYZ. Michael: All right, so let’s talk a little bit. I love to start the interview with some emotion about it. And whenever I make a big purchase, whether it is a car or I am buying a house, or whatever in my life, I have always felt a little nervous, like a little stirring in my gut. When you made your payment totaling 555 thousand dollars for three new TLD applications, were you nervous? Daniel: Actually, to the contrary, there is a saying in real estate that you make all of the money whenever you buy a property, and I view it the same way with the Internet; is that once you buy an asset, you make all your money. And either you build up all the equity at that point of that purchase, so with these application fees of 555 thousand dollars, although that is a lot of money for everybody, for me it was one of the biggest no-brainer investments that I have ever had to consider and had the opportunity to invest in. And the investment that I have put thus far is significantly over the 555 thousand dollars in application fees alone. Subsequently, I have secured the .COLLEGE TLD in a private contention set and that was a significant investment. And in addition to that, the marketing resources and personnel that we have put on the .XYZ promotional project far exceeds a seven-figure investment that will be done on an annual basis. We have a multimillion-dollar a year marketing budget set to promote the .XYZ top-level domain. And when I look at things where I purchased individual domain names in the second left – domains like Degree.com or Ringtones.com -, many of these domain names are seven-figure domain names. So, purchasing the one domain name for seven figures is a lot less than getting an entire name space with an application fee of 185 thousand. Now, the risk in that application fee, of course, was that I might not have gotten the top-level domain. My application might not have gotten approved. So, come the time in the queue, when my application was being approved, at that point I might have been a little nervous if my application was going to get approved or not, but I had worked day and night. I did not sleep for three days when I first wrote that application, and I really, really worked as hard as I could and I put my entire intellectual capital into that application, so I was very confident in getting approved. And very recently I got approved for all three of my applications. So, it was a very rewarding thing, and I actually put it up as one of the most challenging things of my life because I think it was about a 300-page application or so, and it was one of the most challenging adventures I have ever gone through in my life. Michael: All right, so nobody got to a point like you are today overnight, and clearly it took a lot of work to put in the applications in addition to having the massive amount of capital that you needed in order to research it and write it, and support it going forward, just like you are talking about, but I want to backup, because when you first started in the industry, from my research, it appears you did some domain name buying. Then you actually launched a registry on your own. So, I want to go through in progression to figure out how you to got to today. So, when you first started in the industry, were you buying and selling domain names? Were you flipping or were you investing? How do you look back at your early years in the domain name industry? Daniel: Sure. From my original domain investments that I was making, I was purchasing domain names for development ideas that I had. And I was looking to buy domain names for the purposes not to resell them, but for purposes of having strong memorable brands for my own startups. Michael: Got you. So, you have always considered yourself a developer more than a flipper. Michael: And what kinds of domains did you buy in hopes of developing or for development? Daniel: Sure. So, I was looking for names that I could name a startup company of my own. Short, one-word domains. Dictionary domains. Short domains that really kind of defined what a category is, is really the main thing that I look for in purchasing individual domain names. Michael: Got you, and what did you find in your early days? Daniel: The early days were rough. I got domains like GetAPCNow.com. Michael: Yeah, but that was your early, early days. When you actually figured out the industry, when you actually figured out that you needed a single word that defined an industry. Daniel: Absolutely. So, one of the first and largest acquisitions I had made at the time were my initials, and I am sure a lot of domain investors will look at that and say, “Well, what are their initials?” Mine are DMN, and for me, I needed to own DMN.com. And there was a company that started up in the early ’90s called the Digital Music Network. They had raised five million dollars or ten million dollars, and they had spent it all. And it was a very successful product at some point, but they failed as well. They were not able to secure more financing. And there was a gentleman that I found online that owned it, and I did a WhoIS lookup and I called him. He had his cellphone on the WhoIS and he said to me, “Well, how did you find me,” and I said, “Well, I have my ways,” and he actually was an individual who I believe lives in Boston and he happened to be in Los Angeles at the time that I called him. So, we got together for a drink and I mentioned to him that I had an idea and I wanted to buy the domain name, and we negotiated back and forth on the price, and that was the first major domain purchase that I made. And since then, I have had several opportunities to sell the domain name, but I am not looking to sell my initials, and I am actually, just currently, now looking at building my own blog to share some of my business secrets and passions in life, and my skills that I have been able to accomplish so far; I want to share that with the world, and I do not have the ability to have my own .XYZ domain name yet, because the TLD is yet to be delegated. Daniel: So, as an interim, I look to be using DMN.com for that, and I hope to, at some point, redirect it then to DMN.xyz. Michael: Very cool. I know a lot of domain name investors that have three-letter .COMs and I have only recently tried to figure that out. When I had the Costello Brothers on the show and they talked about owning your local cities or towns, I went out and bought my city and town. Now I am feeling like I need to go out and buy my initial, Daniel, so I have got to go check it out. I am not going to tell you what my middle name is. I am going to go check it out before you go and try and negotiate. What was the price that you paid back, I guess, ten plus years ago or ten so years ago? Daniel: I have to check. Hang on one second. Michael: Oh, you have got it right there, huh. Daniel: No, I announced it. Michael: I just a gentleman on talking about Heritage Auctions and their three-letter/two-letter auctions going on. Daniel: I bought DMN.com for a little bit over 22 thousand dollars in 2006. Daniel: And since then, I have received multiple offers significantly over that price, and I have very recently turned down a low six-figure offer for the domain name. So, I am not actively looking to sell the domain name, and I am looking to use it for my business. Michael: Yeah, and they are fantastic domains, because any company that has three words in their name might want an acronym for their domain name. Daniel: Yeah, and some might say that I was born in 1985, which is the first year that .COM was originally registered. And if you look at my initials, DMN could be construed as being short for domain. So, some might say I am born to be in this business. Michael: Very cool. I read on DN Journal, Daniel, that you also own great domains like Driving.com, BestHotels.com, Ringtones.com, and some phenomenal names. I love my educational domain names, not that I have anywhere near what you have, like Degree.com, CommunityCollege.com, and PhD.com. Have you developed out any of these? I did not check prior to the show. Daniel: Yeah, I have. Some of these websites have been previously developed as well. Degree.com was a website since 1996. We have gone through multiple iterations for developing them, and as you know and as any developer knows, there is a constant reinvention of a development project. So, our focus right now has really been on our new top-level domains, and I am pushing forth all of my marketing efforts towards .XYZ. So, now that I am doing that, a lot of my existing .COM domains might suffer a little bit from our development resources, but I do have a team of 25 people in Los Angeles, which is Cyber2Media, which is a professional development company and we keep on top of all the latest development technologies, such as responsive designs. And XYZ.com is an example of one of our recent developments. It is a fully responsive website. It works on mobile devices as well as desktop devices. Michael: Right, and just before we started recording, I fired up my phone and I went to XYZ.com, and I did a preregistration for DomainSherpa. And of course, I am the trademark holder for DomainSherpa, so I was able to click that button that says yes, and it was a beautifully laid out site on my iPhone. Daniel: Yeah, thank you for bringing that up. All of the listeners can go to XYZ.com and make a preregistration request for any domain or any number of domains. And as we release the domains and we do our launch, we will be in touch with you through email newsletter to let you know how you can register the domain when it becomes available. Michael: When you bought XYZ.com, did you have any aspirations of launching a registry service, or did you just think that it was a cool three-letter domain? Daniel: So, I actually wanted to start a registrar service, so I wanted to be like a GoDaddy. And I actually applied with ICANN and I was approved, and I started to develop my registrar software. And I bought some existing source code that worked. We started modifying it. We were ready to go. And all of a sudden, ICANN announced the application window for new top-level domains and, at that point, I pivoted the company to be a registry instead of registrar. Michael: Got you. So, you have invested a lot of time. You have probably focused 100% of your efforts on XYZ.com, the registrar. You had your team working on the software, getting ready for launch, and then suddenly ICANN announces the new TLDs and you just put all that sort of on the back burner. Daniel: So, it was not wasted efforts. I have made some fantastic contacts in the registrar business as well as the registry business. And in doing so, I was able to learn a lot about what is involved whenever a registrar is trying to connect with a registry, because naturally I was doing that. So, I am able to use all of that experience now. As I am the registry, I am able to make the process that much easier for all the other registrars out there that are looking to connect to XYZ.com to promote .XYZ domain names. Michael: Got it. So, even though you may not be moving forward with that, it is a lesson learned. You learned a bunch of lessons around it and made a lot of contacts in the industry that are going to help you going forward. Daniel: Absolutely. And we can touch on a third-level registry, which I had previously launched. Michael: I do. I want to ask you about that next. So, Cyber2Media.com, your company that has, I think you said, 25 full-time employees working there. Do you do work for other companies to develop out their properties or services, or is it all an internally focused, develop your own properties endeavor? Daniel: Absolutely, thank you for asking. Cyber2Media is a full-fledged web development and advertising agency. We work on my properties as well as select clients. We also manage domain names, provide consulting services for domain acquisitions, and we provide a lot of technical backend consulting as to how we recommend people monetize their domain names or manage their digital assets. And we have some strong relationships with Google and Yahoo, where we are some of the largest advertisers in the respective spaces that we advertise on Google AdWords, and we have some technology built there to handle that. And yeah, I have got a great group of people and, really, I would not be able to be where I am today without this solid team that I have been able to build over the years. Michael: Yeah, definitely. How big, from a revenue standpoint, is Cyber2Media? Daniel: We are a privately owned company, so we do not announce those numbers. Daniel: So, I wish I could announce some of the projects that we work on, but because of the confidentiality we have with our clients, we are really behind the scenes. One of our taglines is: “The company behind the company.” So, I cannot say a lot of the really high-profile projects that we had, but you could see some of the projects that we have put online. So, just Llama.com or XYZ.com, or BestHotels.com. And some of these sites have been launched over the years, so they might not be on the latest cutting edge of the technology with the responsiveness, but Driving.com is one. SBA.com is another one. It is a great resource that we have online. And we are constantly innovating. I always put my client’s projects first, so a lot of times my own domain names kind of sit second in line to get the attention that they need, but that is just because of my experience. Working in real estate, I was always working for clients, and I have that kind of ‘customer comes first’ attitude. Michael: Yeah. How did such a young entrepreneur like yourself, Daniel, get the capital to buy phenomenal domain names like Driving.com and Degree.com, and BestHotels.com? It is easy for people to say, “Oh, he is launching a registry because he has got great domains that are developed and they are earning capital, or have cash flow, or they are making good parking unlike my crappy domains,” but how do you even get the capital as such a young entrepreneur to be able to invest in XYZ or buy these great domain names? Daniel: Yeah, absolutely. It has been a collaboration of all the work I have put through my whole life. I have always gone all in, in every opportunity. I remember some acquisitions that I have made where there was one acquisition that I cannot share the domain name, but I had put a significant amount as a down payment to purchase the domain name. It was nearly a seven-figure amount that I put down. In addition to that, I had had the seller finance the domain for me over an extended period of time. The monthly payments were six figures a month. And to come up with that capital, I had put all the money that I had available to me; in addition to that, all the money that I was going to make over the next year committed to that purchase. So, the capital has really started back when I was twelve, when I was making custom made computers. And I sold a 3000-dollar computer and it cost me two thousand. I made a thousand dollars. I had several jobs growing up. I did different entrepreneurial ventures, where I was buying and selling jerseys, for example, and then selling them on Ebay. I made a lot of money doing that as well. I built websites for people and made money doing that. I started working in real estate. I had a very successful run in real estate. And I always parlayed my success into reinvesting into myself and into my business. I never really believed in stocks or investing into other companies, because I have always know that the best investment I could make is in myself. Michael: So, you believe in yourself. You are going to take that thousand dollars of profit that you made off the transaction, and you are just going to invest it into something that you feel strongly about; that you have thought about that you are going to invest in. And either you are going to double down and take twice the profit off or multiple times in the future, or you will lose it, but that is your decision. You are investing in your own decision rather than others. Daniel: Absolutely. I like to be in the driver’s seat. And for me, I am in full control and I make very calculated investment decisions, so for me, with the investment decisions that I make, when I am in control, I know what I am going to do and I am going to put my best effort forward. And if it means I have to work 100 hours a week to be successful, I am willing to work 100 hours a week to be successful. And at the end of the day, I am going to know that the success or failure of my venture had to do with me and it was in my control. And if I gave it my best shot and I was not successful, then so be it, but knock on wood. To date, I have been very successful, and I believe it has been because of the team that I have and the company that I have built, and companies that I have built, and the people that I have around me that have always been there to support me through the good times and the bad times. Michael: Yeah, definitely. If you do not have a great team, you cannot do anything. In Ron Jackson’s story, you said that you started in college and you met Alan Ezeir, I think, the Founder of .WS, and Greg McLemore, the Founder of WebMagic, and that meeting changed everything in your investment life. What did you learn from meeting those two gentlemen? Daniel: Absolutely. I was part of a group known as Southern California Entrepreneurship Academy (SCEA), and they were alumni of that program. And they had gone through it when they were in college as well, and they came back and guest spoke. And meeting them really gave me the motivation to know that, well, they were able to do it and they were just ordinary people who had a vast amount of success; well, why shouldn’t I be able to do it? And that really kind of helped motivate me further. And it is really funny. Alan Ezeir, who I have not seen since 2006 or spoken to since 2006, happened to have read the DN Journal article and reached out to me, thanking me for the compliment I gave him, and I am actually meeting with him on Monday. Daniel: So, I am really looking forward to catching up with him and seeing what he is up to. Michael: Nice. All right. So, you started in the industry. You bought a really crappy domain name to start with. You worked your way up. You bought great domain names. You took any profits that you had from all your businesses. You parlayed it into fantastic domain names. You were a developer, so you were able to generate cash flow off of a business, like BestHotels.com, and then eventually you came to own Com.de. Is that correct? Daniel: Absolutely. So, that is through a company that I run, and .COM.DE is a third-level registry where, at some point, .DE was regulated and they had held back certain two-letter and three-letter .DE domain names. And whenever they released it, one of the domain names that was released was Com.de. And I instantly knew that there is a fantastic business opportunity to sell third-level domain names because many countries run .COM.AU, or it used to be .COM.MX. Now it is .MX. Columbia was run on .COM.CO, but it is still very popular in many countries, like .COM.AU. Daniel: And it was a no-brainer business opportunity. I spent about eight months pursuing the person who ended up acquiring the domain name when it became available, and we made a win-win deal. And I was very happy about it, and that was my opportunity to run a registry and it really gave me the opportunity to do something that I have wanted to do my whole life, which was run a registry. Now, ICANN did not allow for new top-level domains yet, so I have been waiting since 2006, when I met Alan Ezeir, who told me he was running .WS, to figure out how am I going to get my own top-level domain. So, .COM.DE was a great opportunity. It was a very successful launch and it is still a very successful top-level domain. We have great end users who have adopted the TLD, and registrars say it has been a very profitable product for registrars. And all in all, it was a big way in. It gave us the experience and the connections to now be that much more successful with .XYZ. Michael: So, it is basically just a domain name under the .DE top-level domain, right? So, if I lived in Germany, I could go register DomainSherpa.de, for example, and then I could sell third-level domains – www.DomainSherpa.de or Daniel.DomainSherpa.de – to other people that wanted to buy them. That is essentially what you have created with this registry. Daniel: So, I am going to back up, because you said .DE. It is .COM.DE. Daniel: DomainSherpa.com.de. So, you can go to InterNetX and register DomainSherpa.com.de. Michael: Right, but essentially you started just with a domain name, right? You bought Com.de. Michael: And then you built a registry on top of that. Daniel: Sure so. The way that that works is that there is a domain name called Com.de. So, we setup a registry on Com.de, where we can sell subdomains, essentially third-level domains. Daniel: And we run it exactly like we would have run an ICANN registry, where we wholesale it to the different registrars, like InterNetX or Key Systems or Strato, which are all very large registrars in Europe. And they sell it to end customers who will go in and register Claus.com.de. And I have to take a moment and really thank my partners in Germany for allowing and accepting the top-level domain .COM.DE and for helping with the marketing of it, because without Hawkin and Thomas and Claus at InterNetX, we would not have been able to be as successful as we are today. Michael: Do you find that most people that register domains on .COM.DE are in Germany? Daniel: Yes, but however, at the same time, there are many companies who are looking for a presence in Germany. So, there are many companies who are looking for a presence in Germany, but in order to register .DE domain name you actually have to have a registrant agent in Germany. So, it could be a cumbersome process for you to get a .DE domain name. With .COM.DE, we actually have a trust setup in Germany and we have a registrant agent in Germany, which runs a Domain.com.de and, subsequently, anybody around the world can register the .COM.DE of their choice. Michael: And you run this third-level registry. Is that the correct way to refer to is; as a third-level domain registry? Michael: Okay. You run it just like it is ICANN accredited. You use CentralNIC as your backend. They run all the systems to take orders. To somebody that is uneducated about how ICANN accreditation works and your registry, they look identical. Daniel: Absolutely. So, CentralNIC runs the backend and they also power many other country code domains, like .LA, for example. And they run .COM.DE to the same standards that they run any of their other top-level domains. Michael: When you thought about launching this, did you look for partners to work with, or are you the primary shareholder of .COM.DE? Daniel: So, we do have some partners, but when I looked to launch it, the first thing I looked at was actually distribution partners that I was looking for. And I remember being at Domain Fest in Santa Monica, sitting with Hawken Ali, the Founder of IntraNetX, and pitching him the idea of selling .COM.DE third-level domains. And we came up with a marketing plan and we executed on it. Michael: How do you know he is not just blowing smoke at you, Daniel? I go to these conferences and I sit next to people. I’m like: “I should think about buying that domain, because I am developer. I can build something on there,” and I get people saying, “Yeah, that is a great idea.” How do you know when it is actually a good idea to do something like that? To invest a lot of your personal time as well as your capital to buy – I don’t know – I am going to guess a seven or eight-figure domain like Com.de and build a registry on top of it, especially when, nothing against InterNetX or anybody that works there, it is to their advantage to have more things to sell. It does not necessarily mean it is going to be a profitable endeavor for you. Daniel: So, with a domain like .COM.DE, there is a natural demand for it, and I knew that. So, because of the other country codes that were promoting .COM.AU, it is known to me that people will and want to register a .COM.DE. In the United States, people register .COM mainly. People do not register .US domain names. In Germany, they register .DE. The second thing they register in Germany is .COM. So, people are looking for alternatives and I think, at the time, there might have been ten or twelve million .DE domain names, so the space is somewhat saturated. Well, people are registered three, four, or five-word with hyphens in the .DE zone, when they can register a one-word or two-word .COM.DE at a very attractive price. It is kind of like the equivalent of being a .NET in Germany. Michael: Right. Wow. Is .COM.DE profitable today, Daniel? Michael: Have you received payback from your investment? Michael: Looking forward on all these new TLDs, how many domain names do you need to sell on a recurring basis to be profitable? Daniel: Well, that depends on how much marketing effort and how much human resources I put towards it. With .XYZ, as I mentioned earlier, we have a multimillion dollar a year marketing campaign. So, we have not announced our final pricing. We are planning on being a low-cost domain extension, so we are going to be very competitive with our pricing as to the auctions that are available today. And I can share that with .XYZ, because of the success that we have had with registrars so far and the enormous interest that we have gotten from registrars around the world to carry the product, we have raised our expectation numbers to a million registrations of .XYZ within the first year, and we believe we are going to get five million registrations within the first three years. Michael: Wow. So, even if it was just a million as a round number, and use ten dollars as a registration cost, that is ten million dollars in revenue. Not all yours of course, and you have wholesale pricing, but are you looking to be even less than a ten-dollar registration cost? Daniel: That is something that is going to be controlled mainly by the registrars. However, we are going to be providing pricing guidance and we would like to see the domains be sold at a very competitive, affordable price. Michael: Got you. And how many domain names have been registered in .COM.DE? Daniel: We do not publish the zone files. Michael: Okay. And is there no way for me, as somebody that wants to look into investment to try and download zone files on .COM.DE? Daniel: That is something that would be provided by CentralNIC, and you could just go and try to register .COM.DE at InterNetX or Strato, or any registrar in Germany. Michael: Got you. All right, I know we only have a few more minutes, Daniel, so I want to move into the .XYZ. We talked about your investment in .XYZ, why you were not afraid, the .COM.DE as sort of an experience base for you and having met one of the Co-Founders of .WS, and gone through the whole registrar process so you clearly understood it. Do you think .COLLEGE or .XYZ is going to launch first? Daniel: .XYZ. We are planning on launching at the sunrise, in the first quarter of 2014. And we are working very hard to get our Founders Programs ready, so we can have a land rush in the second quarter and general availability in the third quarter of 2014. Michael: So, when you say land rush that means that open enrollment will start basically. Open registration. Daniel: No, open registration is general availability. Michael: Oh, I am sorry. Yeah. Daniel: Land rush is another phase in the launch process, which will allow people to secure the domain name first over other people at a set fee on a kind of ‘first come, first serve’ basis. Michael: Right. And if I am an investor and I want to get some of the really premium domain names, how do I go about letting you know that I am interested in that domain name? Daniel: Got to XYZ.com and preregister the interest in the domain names, and we will keep you informed on the land rush dates and how you can participate in the land rush phase and/or the founders programs. And once those dates are finalized and are available, then you will know. The best thing to do is to go on Facebook and like our page. Go on Twitter and follow us there. And most importantly, sign up on XYZ.com and confirm your email address. Michael: Right, but I am a nobody in the industry, Daniel. Your team is not going to know Mike Cyger when you have got Rick Schwartz and Mike Berkens, and all these guys that do regular investing in new top-level domains saying, “I want a piece of all of the really premium domain names.” Is that the way that I try and get into the founders program? Daniel: So, we are not planning on discriminating against anybody, and we are running an open registry. And that being said, we are looking at all of the preregistration requests that come in. And the preregistration request adds you to a mailing list, which we will communicate with you to update the dates for you. So, I think the best chance for you and your viewers are to actually go and preregister something today. Michael: All right. Excellent, I have just done that, and people can go to XYZ.com to do that. Daniel, if you had to look into your crystal ball and see, in ten years, what .XYZ looks like, do you think it is going to be as popular as .COM? Do you think it is going to be more popular than .NET? Do you think that the other TLDs are going to sort of wash out people’s expectations about TLDs? What do you see happening? Daniel: Sure. So, right now, people think of the Internet, they think .COM, .NET, and .ORG. I am looking to the next three to five years for people to start thinking .COM, .NET, and .XYZ. In the next ten years, I am hoping that we will be able to serve our marketing mission: provide Internet users enough competition and innovation and choice with the .XYZ top-level domain, where people will think of .XYZ as their first choice when it comes to registering a domain name for any product, service, personal blog, and/or business. For anything Internet use, I want people to think .XYZ, and then .COM and .NET, and .COLLEGE. Michael: Of course .COLLEGE, but I do not understand what .XYZ means to me. Why would I want to go register? You talk about earlier, one of the first domain names you bought was DMN.com and that you are going to launch a blog on it. Why wouldn’t you say, “I am going to launch DMN.xyz to begin with,” and put your blog there? Daniel: Because .XYZ was not available yet. So, now that I am making .XYZ available, that is where I will be launching my blog. Daniel: And the beauty behind .XYZ is we are aiming to be the default TLD. We want to be the main domain extension that exists out there so that when anybody in the world thinks about registering a domain name, they could think about it ending in .XYZ. It is three letters. It is easy to remember. It is the last three letters of the alphabet, so why not end the domain extension with it? One of our marketing promotions that we are running right now has to do with the targeting. Somebody else asked me, “Hey, Daniel, who are you targeting? What generations are you targeting? Are you targeting Generation X, Generation Y, Generation Z,” and the way they asked me the question, it hit me. I said, “We are targeting Generation XYZ. We are XYZ.” It encompasses all of the generations that are out there to register domains today, and we look to really be there to provide Internet users with another choice to register domain names and to provide domain investors, domain developers, businesses, individuals, and the like the opportunity to get a relevant, short, easy to remember domain name that was launched with the intention to be the generic default domain name. .XYZ is the more generic new top-level domain name there is. You cannot get more generic than that. When you look at the launch of other TLDs, like .COM, .COM was launched for commercial institutions. .NET was launched for networks. .ORG was launched for organizations like non-profits. Now, those TLDs are being used for different reasons. .TV was launched for the country of Tuvalu, but it’s used to advertise TV now. Daniel: And .XYZ is being launched to be the default extension for Internet users around the world, regardless of the language they speak. It is an easy to remember, short domain extension. Michael: Yeah. All right, before the final question, Daniel, I want you to zoom down and show me your XYZ t-shirt. I love the logo that you have. And zoom up. I want to see the neon sign you have there. There you go. That is an awesome, awesome piece of artwork there. Is that a local artist that designed that for you? Did you have it commissioned? Daniel: This is a local artist. His name is Kelly Graval. He goes by Risk, and that is his graffiti name – street name. And he is a good friend of mine, and I acquired this ten-foot guitar, which was manufactured by Gibson, at a charity auction run by the City of West Hollywood. This guitar was actually on Sunset Strip in West Hollywood for a year, for promotion that the City of West Hollywood had, and I then commissioned Kelly Graval to redo the guitar and add some pictures and colors, and add a .XYZ to it and really kind of customize it. So, we are very happy with the way it turned out and it is a one of a kind piece of art, and I do not see any other TLD coming up with a ten-foot guitar. Michael: No, and if you move your camera down a little bit, the logo that you designed up for .XYZ is pretty awesome also. In my research I stumbled upon the artist that designed it for you, and he has done some phenomenal work as well. How did you find that artist that designed up your typography and design? Daniel: Absolutely. He is a full-time employee. Daniel: Yeah, and just goes to show you the quality of skills that we were able to nurture here. Daniel: And he is also a friend. Michael: Excellent. All right, so here is the final question, Daniel. I know that you have stated earlier you make money on the buy, Warren Buffet thinks the same thing. He is a value investor. You do not make money when you sell. You make money when you buy. You have got to look for your opportunities that are undervalued, where other people do not see it being an opportunity. He looks for the assets. Do they have cash flow? Is it an investment for the long-term? He wants other people to think that it is not a good investment, but as long as he sees the right metrics, he is willing to invest. What do you think Warren Buffet would say about your investments in domain names like Driving.com and BestHotels.com and your investment in top-level domains, if you were to chat with him today? Daniel: So, that is a great question. Believe it or not, I have asked him a similar question before. Not specifically in the domain names individually, but when I had the opportunity to meet him and have dinner with him, and lunch the next day, I did have a decent amount of time to talk to him. And I asked him what some of his thoughts were in these types of investments that I was working on. And for him, because it did not make sense to me why wouldn’t one of the richest men in the world be investing directly in this, and he said, “Well, it does not move the needle for me.” That is why he loves the stock market; because, for him, he is a value investor, but he is also trying to grow billions and billions of dollars. Daniel: So, for someone like me, who is trying to grow my millions into billions, then it makes sense for me, but interestingly enough, he has upped his stake in VeriSign, so he does see that there is opportunity and value in the top-level domain space. And I believe that he would be all over investing in me, in .XYZ, in driving .COM and all of my domain names. However, at the moment, I am not looking for any outside investor capital, so he will have to get in line and wait. Michael: Yeah, and Warren Buffet did increase his stakes significantly just this year alone in VeriSign, so that is a big tell for the industry. Daniel: Yeah, absolutely. And maybe one day I will accept investments and I will reach out to Warren Buffet, but until then, we are self-funded, profitable, very successful, and we look forward to continuing our success with the launch of .XYZ, .COLLEGE, and .NOW. Michael: Well, I cannot wait for that day. If you have additional questions, please post them in the comments below and we will ask Daniel to come back and answer as many as he can. Daniel Negari, Founder of .XYZ, which you can go preregister at XYZ.com. Thank you for coming on the show, sharing your knowledge about the domain name industry, and thanks for being a Domain Sherpa. Daniel: Take care, Mike. Thank you. It was great interview, I think Daniel will make a great success within 5 years, from optimistic point of view .xyz is good looking extension for the next generation. I look at it from if we want to drive cars with fuel, or be modern and drive electric cars, for the next generation the answer is obvious. Although I still don’t understand why single letter is not available all the time, even 2 letters. Thank you for the professional interview. Daniel, the application for the third level extension com.de had the same fabulous high fees, like for .xyz (ICANN)? The application for com.de had to be submitted to INTERNIC? There is somewhere a guide for that, including the fees? Dear Daniel, I would want to ask you please if there is a standard procedure to become the owner of a new extension. We must submit an application to ICANN? There is a financial requirement for that? Good Luck with .XYZ !!! I think we all need to sit back take a deep breath and watch the transition of these new GTLD’s before making any firm judgement. It’s obviously a new frontier and an evolution for the domain name industry and making any predictions at this point, would be quite premature. One this is for certain. Successful businesses and Individuals like Danie who have made the necessary commitments and investments in this space, must understand and believe, in this new dynamic and marketing frontier. This alone should be an indicator to what the future in domain names holds. I personally am interested in a .xyz domain name for my concept. Not a great TLD imo. But unlike most TLD applicants, he owns the string in .com which is a huge advantage. Yes, if subdomains are automatically added as xyz domains are issued with redirects then its a great safety feature. (Not sure if they’ll do that, need some sort of automation, although they could pre populate and have any 404s before domains released pointing back to the xyz.com). There is a lot of debate on the new gTLDs its nice to hear from the operators what their goals and plans are to make them successful. Hope to see more of these types of shows in the future. Good luck Daniel looking forward to the launch! I cannot even imagine .xyz to be successful. I agree, its not a business, its a hobby. However, depending on what the run cost of a registry is, it could technically be feasible to make money from a registry perspective on some low volume (which I don’t know and haven’t worked out). Hence, a number of TLDs could be successful from a registry perspective but not from a domain investor perspective. Anyway, as they say, ‘who dares wins’….. I know nobody is ever going to say what the breakeven registration volumes are, but if that hurdle can be achieved with most TLDs then I’m sure we’ll see more and more TLDs being sought. Exactly. S/he who dares, has the opportunity. If you never try, you’ll never succeed. I agree .now is powerful. I can’t wait to see what .xyz does for marketing. I just pre-registered some .xyz domains just now. I’m not sure if it will work out to be as big as Daniel thinks it will be, but his motivation and drive behind it makes me think it could catch on. I agree that Daniel’s passion for the extension is contagious. It will be interesting to see how it develops. .xyz is on my watch list. Thanks. Thanks for watching and commenting, Kassey. Thanks for taking the time to answer my question. If I could ask another? How much input from domainers do you think is necessary, if at all, for the success of .xyz or any other new tld? Will you market the extension at a TRAFFIC conference for example? Not sure I agree with .xyz being a good extension. 2. symbolism. this is the ‘end’ of the alphabet. i would assume symbolically that businesses want to be at the front. Think of all the businesses that begin their name with A or A1 because they wanted to be the first listing in the Yellow Pages. 4. comparatively stacked against everything else coming out it does not stand out. I’m with you Mike, I don’t understand what .xyz would mean to you (or anyone for that matter) and the answer was anything but convincing. That said, another great interview. Always interesting to hear these stories and the different paths that lead them to their success. Thanks, Scott. I think it appeals to different people in different ways. For example, I won’t get a tattoo, but according to http://www.statisticbrain.com/tattoo-statistics/ it’s a $1.65B industry and 14% of Americans have at least one tattoo. Just because it’s not for me doesn’t mean that it’s not for everyone. From our discussions with brand owners, entrepreneurs, marketers and individuals we’ve found that most people do not want their TLD to define their product or service. They want something that will be memorable but also does not interfere with the message they are trying to project with their brand and domain name. While .web seems logical because websites exist on the “web,” most companies, projects or individuals do not want consumers to think of them as a “web” company or product — even if they primarily exist over the internet. (Not to mention that the word “web” is painfully 1990s). This logic applies also to “non-generic” domain names other than .web. The success that .com has enjoyed is less because it stood for “commercial,” but because it turned into the most generic and, as a result of being the most popular, the most memorable. .xyz is a very intuitive and memorable way to end a domain name, but it is not weighed down with the meaning of a dictionary word. Plus, unlike .web, “xyz” is easily-recognized by non-english speakers (even in languages that don’t use the Latin Alphabet). In short, it’s the best kind of “generic” TLD. Hope that helps! Thanks for your interest. a great video again, Thanks DomainSherpa! Huge investment! Huge risk but equally HUGE rewards! I think .xyz could make sense to an extent, but the extension may not make any good returns to justify the money spent. The people who has the generic will only need to buy the .xyz to prevent their trademark infringement. But I salute you Daniel Negari for your corrage and initiative; your money can not waste, no matter what, you will recover your money and gain some money and fame. Daniel is definitely courageous to put in three registry applications. It’s a great story and I have no doubt he’ll run a successful registry. I’m not sure I understand what you mean about people who own generic domains will need to register .xyz to prevent trademark infringement. Generic words aren’t trademarkable under the USPTO. Do you mean “non-generic”, or just trademarked domains? Anyone with a trademark is going to have to make decisions about what to register, what to block and what to let go — and potentially file a UDRP for in the future. Small businesses with limited resources will have a tough time planning out their strategy for the new TLDs, including .XYZ. Thanks for watching the interview and commenting, Boluji. Thank you Mike for that observation. What I really mean are big names like ebay amazing and etc will only need to prevent people from having domains that looks like their names, in other word to prevent their trademark. Thanks for the great information that “even I can understand”. Even though you have crappy domains Michael, your talents and contributions to the industry lie elsewhere. Thats it, I’m applying for the TLD .LOL ….. lol…. Some very nice domains there Daniel! XYZ is a phenomenal domain and I wish you the best of luck with the extensions. Thanks for watching and taking the time to comment, James. Great interview. Thank you for both taking the time to let us know more about your story and the .xyz extension. why would someone register a .xyz domain over, say a .web domain which is equally as short and generic? As Daniel said, I agree that .XYZ will appeal to a group of people and companies who don’t want to necessarily identify with a “brand” like .com or .web. To each their own. I also think marketing will play a key role. Take, for example, .CO. I think Juan and team have done a fantastic job making it the extension for startups around the world. .XYZ is even more unique, so I think the task of marketing will be a bit easier in comparison.